Few things change as rapidly, and as often, as Canadian food tastes and preferences. Here’s a look at three trends that are here to stay, including insights on how your brand can get involved today and prepare for the future. Fresh off the… stove, here’s a look at how Canadians are thinking about multicultural cuisines, healthy eating, and food consumption and waste. Canada embraces a wide diversity of culture with one in five people being foreign born. A recent Ipsos study among approximately 2,100 self-identified multicultural Canadians estimated that there are 8.2M multicultural Canadians—and that number is projected to increase to 12.6M by 2031.1 This growing segment of the population is having major effects on food and beverage trends throughout the country. Ipsos FIVE data shows that per capita consumption of Ethnic Foods is growing at 3X the rate of Total Food. This demand for unique and ethnically inspired flavour profiles is a call to action for brands to expand their portfolios to be relevant to Canadian consumers. The health food craze in Canada is no fad diet. 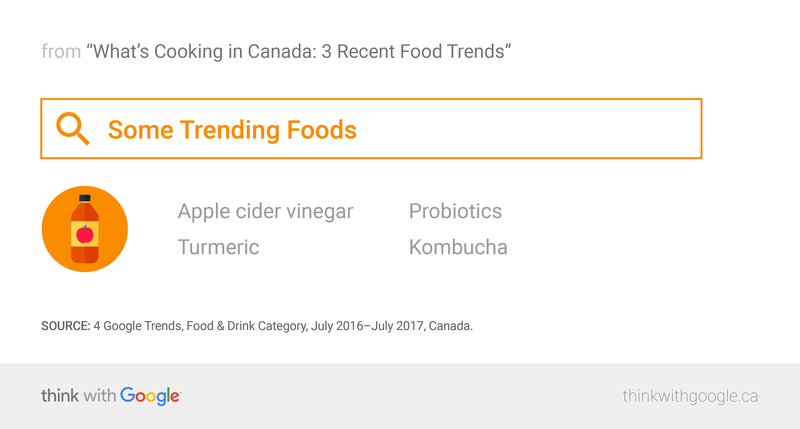 These days Canadians are more and more interested in eating and staying healthy. In fact, 49% say they are more interested in consuming healthier foods than they were two years ago.5 Even the government is getting in on the action. Canada’s New Food Guide emphasizes plant-based proteins and other natural foods. To raise their food IQs, Canadians go online. More than half (54%) have used online sources to increase their awareness of the benefits of healthy foods.5 They’re searching for health information, recipes, tips, and ingredients. Another hot topic in Canada is the flip side of delicious food consumption: food waste. Up to $31B of food is wasted every year in Canada and it’s estimated that 47% of that happens in people’s homes.6 It’s a serious enough issue that the government, businesses, and now consumers are committing to find ways to reduce waste. For some Canadians, it’s all about getting creative with the extra food they have in the fridge. Whether it’s homemade leftovers or food they carted home from a restaurant in a doggie bag, Canadians are looking for ways to creatively repurpose food. Educate: Find ways to show consumers the functional and environmental benefits of your products and brand. If your brand has made commitments to the things Canadians care about, tell your story! Create content: Create relevant content that shows consumers creative ways to use your products. Think leftover repurposing videos, superfood recipes, or ethnic food cooking tutorials. Test and learn: Use Google Trends to learn more about trends for your specific category. Play around with different content and keywords to learn what’s resonating with consumers. Organize: Structure your brand teams to stay ahead of the curve on long-term consumer trends. Build agility into your business model to be able to action those opportunities quickly. Innovate: Influence product roadmaps to include more diverse ethnic innovation for the Canadian market. This is an exciting time in Canada as mindful food consumption is increasingly important to consumers. Get clever and have fun tapping into Canadians’ desire to eat healthfully, sustainably, and multiculturally. 1 StatsCan, Canada, 2011; “Multicultural Canadians” are those who identified using country of origin or ethnic identity and are defined as Central/South American/Caribbean, Mexican, Middle Eastern, East/Southeast Asian, South Asian, Other South Asian/Southeast Asian, or Other. 2 Ipsos, “Environics Research Group,” 2015. 3 Ipsos Five, R12M Ending December 2016, Canada. 4 Google Trends, Food & Drink Category, July 2016–July 2017, Canada. 5 Google Consumer Survey, April 2017, Canada, n=1,000 online Canadians 18+. 6 Value Chain Management International, “27 Billion Revisited: The Cost of Canada’s Annual Food Waste,” 2014.